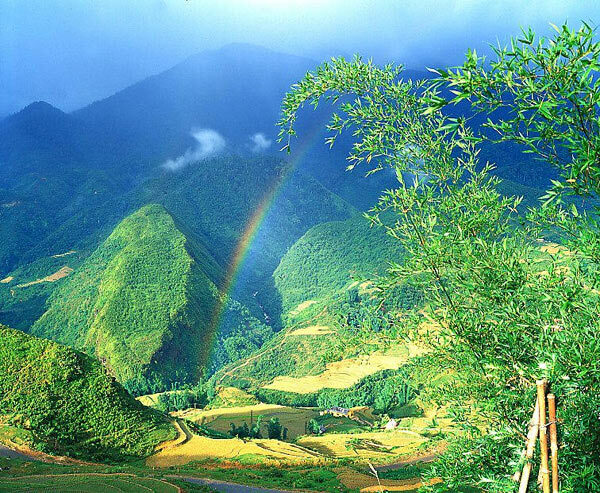 The four seasons are distinctly felt in Sa Pa, Vietnam when nature changes her costume. The four seasons are distinctly felt in Sa Pa when Nature changes her costume. Spring in the season of pear, peach and plum flowers. Summer comes blooming with Gladioli, Pancies, Dahlias, Sun-flowers and numerous temperate fruits. Autumn is the time for perfume mushrooms, woodears and plenty of specious medicinal plants such as Black Ginseng, Amomum,Cinnamon, Anise etc. The sky is the vividly brightened with golden sun-rays and playful white clouds which seem to land on the ground, over the heads of people or on tops of trees. In Winter, the forest is almost whitened with snow, making the landscapes look more attractive. But Summer is said to be the most charming season in the year. It is extremely interesting to experience all the four seasons within a summer day time: spring in the morning, summer at noon, autumn in the afternoon and winter in the evening and at night. Transfer from your hotel to Hanoi Railway Station for the night train to Lao Cai. Overnight in AC soft sleeper cabin. Arrive in Lao Cai around 5.30 am. We will take 1hr bus ride uphill to the beautiful town of Sapa. The ride give you a glimpse of the stunning vistas and impressive rice terraces. Upon arrival in Sapa Town we have breakfast in local restaurant and prepare for a great trek down to the picturesque valley of Muong Hoa. You will commence your journey from Sapa by car to Lao Chai village, a Black Hmong ethnic minority village. You will then be able to walk from Lao Chai to Tavan village where the Giay ethnic minority hill tribe lives. After lunch the walk continues through a bamboo forest to Giang Ta Chai, a Red Dao ethnic minority village where we will have unique homestay experience among hill tribe people. Pinic lunch on the way. Dinner and overnight in the local house. After breakfast, we start the trek through the rice terraces to the village of Su Pan then continue to Thanh Kim for lunch. After lunch time, we will trek along a narrow valley downhill for 2 hour to the Ngoi Bo River, then uphill for 1 hour to Muong Bo Village at the center of Thanh Phu Commune - a village of Tay minority. We will have dinner and stay overnight in a wooden Tay stilt house. After breakfast, we walk down hill to Thanh phu bridge to take a beautiful drive back to Sapa. Upon arrive in Sapa we take shower and spend the rest of the day exploring Sapa town. 5.30 pm we will be transferred to Lao Cai for the night train back to Hanoi. Arrive in Hanoi around 5 am. Tour ends at Hanoi Railway Station.